The joint statement calls on all states to "intensify their efforts to outlaw nuclear weapons and achieve a world free of nuclear weapons" and expresses "deep concern at the catastrophic humanitarian consequences of any use of nuclear weapons". Referring to "the horrific consequences" of the use of nuclear arsenals, made clear by the suffering caused by the U.S. atomic bombings of Hiroshima and Nagasaki in 1945, the joint statement says the only way to guarantee that such weapons are never used again is "the total, irreversible and verifiable elimination of nuclear weapons." The move was initiated by 16 member states of the United Nations: which include Austria, Chile, Costa Rica, Denmark, Holy See, Egypt, Indonesia, Ireland, Malaysia, Mexico, New Zealand, Nigeria, Norway, the Philippines, South Africa and Switzerland. At a preparatory committee (PrepCom) meeting on Nuclear Non-Proliferation Treaty Review Conference on May 2, 2012 in Vienna, they issued a similar statement. But, unlike this time, they did not ask Japan to endorse the initiative. Explaining Japan's decision, senior vice foreign minister Kazuya Shinba said at a news conference in Tokyo on October 22: "We have decided to refrain from participating" in the initiative, adding that it "isn't necessarily consistent with our country's national security policy". Soon after the Japanese government's intention was reported on October 19, 2012, the Nagasaki Mayor Tomihisa Taue visited the Ministry of Foreign Affairs (MOFA) to urge that the country has a moral obligation – as the only nation that underwent nuclear holocaust – by endorsing the joint statement. Taue, mayor since 2007, is also vice president of the Mayors for Peace organisation, which was established in 1982 by the mayors of Nagasaki and Hiroshima – on which the U.S. dropped atomic bombs in August 1945 killing more than 200,000 women, children and elderly. Those who survived the first atom bombs in history – known as Hibakusha – suffer even now from the aftereffects of radiation. According to reports, MOFA explained to Mayor Taue that it was difficult for the Japanese government to have it both ways – approving the joint statement seeking to outlaw nuclear weapons on the one hand and being protected by the nuclear umbrella provided by the U.S. on the other. 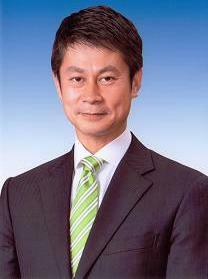 After meeting with MOFA officials, Taue reiterated his view in an interview with Nagasaki Broadcasting Company (NBC) published on October 19 on YouTube that the joint statement was just urging nations to make efforts towards outlawing nuclear weapons; therefore, Japan should take a clear stand by supporting the statement. Taue was born in 1956, a decade after atomic bombs laid waste the cities of Hiroshima and Nagasaki. But the eyewitness accounts of those who survived the bombings left a deep impression on him and inspired him to become a crusader for a nuclear weapons-free world. His commitment was also underlined in an eminent civil society presentation to the Prepcom for the Nuclear Non-Proliferation Treaty Review Conference in Vienna. The Nagasaki Mayor asked government representatives: "Isn't it absurd that investing the immense sum of 1.63 trillion dollars worldwide on military expenditures such as in 2010 in the name of national security has only led to a more dangerous world? Is it not time now to display the strong will required to free us from that danger?" Like Mayor Taue, Mayor Kazumi Matsui, who was born in 1953 in Hiroshima as son to a Hibakusha father, has also been championing the cause of nuke abolition. 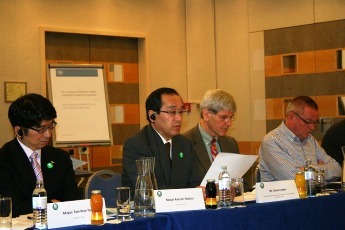 In fact, he has been exploring the possibility of holding the 2015 NPT Review Conference in Hiroshima city. On August 6, 2012 – remembering the day atomic bomb was dropped on Hiroshima in 1945 – Matsui said: "People of the world! Especially leaders of nuclear-armed nations, please come to Hiroshima to contemplate peace in this A-bombed city." During a meeting with a team of journalists in September, he pointed out that in 2012, which marked the 30th anniversary of the Mayors for Peace, the number of cities calling for the total abolition of nuclear weapons by 2020 has passed 5,300, and members now represent approximately a billion people. "Next August, we will hold a 'Mayors for Peace' general conference in Hiroshima," he said. "That event will convey to the world the intense desire of the overwhelming majority of our citizens for a nuclear weapons convention and elimination of nuclear weapons. In Spring 2014, Hiroshima will host a ministerial meeting of the Non-Proliferation and Disarmament Initiative comprising ten non-nuclear-weapon states, including Japan. I firmly believe that the demand for freedom from nuclear weapons will soon spread out from Hiroshima, encircle the globe, and lead us to genuine world peace," Mayor Matsui added. He and the Hiroshima Prefecture's Governor Hidehiko Yuzaki who has launched 'Global Peace' plan – formally announced on November 4, 2011 – are in fact 'Hiroshima twins' relentlessly campaigning for a nuclear weapons-free world. Under the plan the Prefecture aims to be actively involved in multilateral nuclear disarmament negotiations and the development of human resources for peace-building thereby boosting efforts to abolish nuclear weapons. During a meeting arranged by Hiroshima Soka Gakkai in September, Governor Yuzaki said that the Prefecture had come up with a new approach by which Hiroshima can work toward peace over the next 50 or 60 years. "Thus far Hiroshima has had an influence on the world through the atomic bombing survivors' accounts of their experiences and in other ways. Through this plan Hiroshima will continue to exert its influence on the world but in a new form." The action plan, the core of the overall plan, consists of five elements: 1) support the creation of a road map for nuclear abolition; 2) reduce the threat of nuclear terrorism; 3) develop human resources for the building of a peaceful international community; 4) amass research on nuclear disarmament, conflict resolution and peace-building; and 5) create a sustainable mechanism to support peace. Specifically, one of the plan's goals is the start of multilateral nuclear disarmament negotiations, and it proposes holding a 'Hiroshima roundtable' in which senior government officials of nuclear-weapon states could participate as individuals. The plan would also create a mechanism for the evaluation and "grading" of disarmament efforts such as the implementation of the final report of the review conference of the Nuclear Non-proliferation Treaty. It further proposes the creation of a centre for research and the training of experts to assume responsibility for the resolution of regional conflicts. Against the backdrop of Nagasaki and Hiroshima striving for a nuclear weapons-free world, the Japanese MOFA's announcement is a source of concern to representatives of the opposition New Komei party's committee for the promotion of nuclear abolition. Addressing Foreign Minister Koichiro Genba, the committee's four members from the lower and upper house of the National Diet have stressed the inhuman aspect of nuclear weapons. Referring to the debate in the first committee of the UN General Assembly, they point out that Norway will hold a conference in Oslo in March 2013 to focus on the humanitarian impact of nuclear detonations, as well as ability to respond to such a disaster credibly and effectively. The conference will provide greater insight and a fact-based understanding of the humanitarian consequences of a nuclear detonation, deputy director general and head of the division for disarmament, non-proliferation and export control in Norway's Ministry of Foreign Affairs, Inga M.W. Nyhamar, informed on October 18. "We, the Foreign Ministers of Australia, Canada, Chile, Germany, Japan, Mexico, the Netherlands, Poland, Turkey and the United Arab Emirates, resolve to move forward with practical steps that will advance the implementation of the 2010 Nuclear Non-Proliferation Treaty (NPT) Review Conference Action Plan ('Action Plan') and to pursue the goal of a world free of nuclear weapons. We acknowledge the efforts of many states towards achieving these objectives but also recognise that much more needs to be done." Also Ambassador Mari Amano said during the UNGA First Committee discussions on October 17 that "the tragic consequences of nuclear weapon use must never be repeated". He added: "As the only country to have suffered from atomic bombings, Japan had engaged in practical and progressive efforts for a world without nuclear weapons. As part of those ongoing efforts, Japan would once again be submitting to this Committee a draft resolution on nuclear disarmament entitled 'United action towards the total elimination of nuclear weapons'." The New Komei party members recalled in their letter to Foreign Minister Genba a resolution of the International Federation of Red Cross and Red Crescent Societies (IFRC), approved on November 26, 2011. The IFRC said that it was "deeply concerned about the destructive power of nuclear weapons, the unspeakable human suffering they cause, the difficulty of controlling their effects in space and time, the threat they pose to the environment and to future generations and the risks of escalation they create". The four parliamentarians – Masao Akamatsu, Masayoshi Hamada, Masaaki Taniai and Kozo Akino – stressed that the New Komei party favoured the convening of a nuclear abolition summit in Hiroshima and Nagasaki in 2015 inviting heads of nuclear states. "As a step toward the realization of the summit, we must make the scheduled NPDI foreign ministers meeting to be held in Hiroshima in 2014 a success. Japan should take a leading role as the chairing nation in clearly positioning 'inhumanity of nuclear weapons' in the course of debate on 'lessening roles of nuclear weapons' which has been positioned as one of six NPDI working items," the parliamentarians said.